Guys. I have a 21 month year old, and I have to admit the terrible two’s have already shown their ugly head. The little man is asleep right now, passed out after a tantrum…so I’m using this time to vent, and do one of my favorite things, share healthy recipes. On days like this, as some of you Mom’s out there can hopefully relate, there is nothing like a comforting, easy, one-pot, minimal clean-up meal that also happens to be tasty and healthy at the same time. Even if you are not a mom, or if your kids are grown, it’s still a good go-to when you just don’t want a hassle. 1) Heat 2 tablespoons of the olive oil in a large, deep pan and cook cubed chicken over medium-heat, stirring frequently. 2) Sprinkle chicken with Italian seasoning, salt, and pepper. Once cooked all the way through, remove from pan and set aside. Cover chicken to keep warm. 3) Add remaining tablespoon of olive oil to pan, heat, and add diced onion, cooking until it appears translucent. 4) Add minced garlic, cook about 1-2 minutes more. 5) Add chicken broth, diced tomatoes, red pepper, and pasta. Can add a dash of salt and pepper again at this point if needed. 6) Add back cooked chicken, stir well. Bring to a boil, then reduce heat and allow to simmer for 15 minutes, covered. 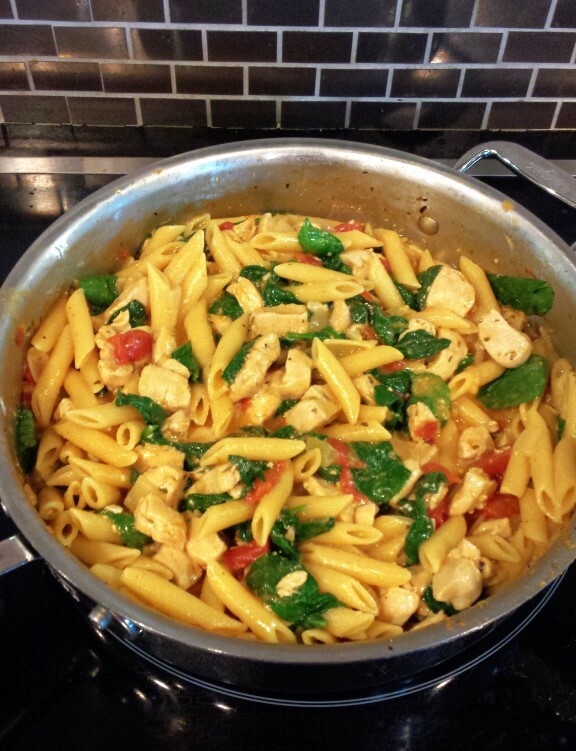 7) When pasta is tender, add milk and mozzarella cheese, stir well. 8) Once cheese is melted, remove from heat and add spinach, gradually. 9) I say add spinach gradually as it takes up a lot of room at first and seems like A LOT of spinach, but once cooked it wilts into almost nothing. So adding the whole 5 oz works out in the end. 10) Serve into bowls and top with a little parmesan cheese. Voilà! No artificial ingredients and satisfying. 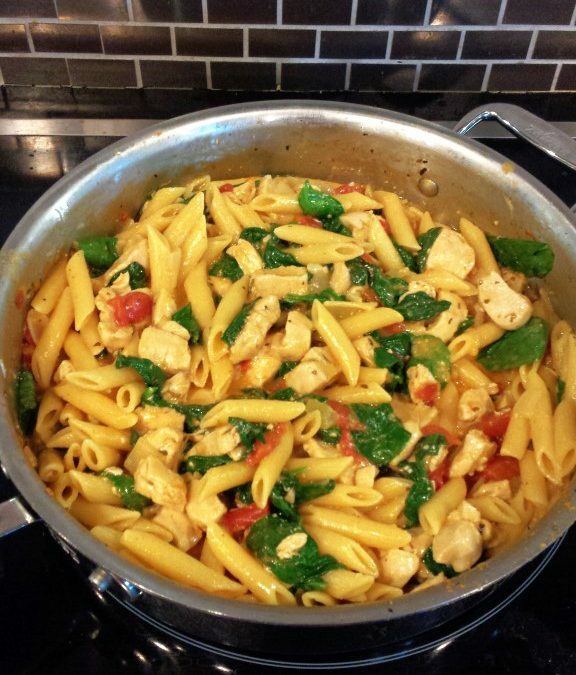 The vitamin C content from the tomatoes even helps absorb the iron from the spinach and chicken. This proved to be a kid-winning dish also, as Matthew went to town on it. I especially appreciated that because he has refused a lot of protein lately (amongst other things). This did not come out spicy at all when I cut back on the red crushed pepper, so if you like a little zing, add the full 1/2 tsp or more depending on your taste. I have seen a lot of awesome clients lately who are taking charge of their health, preventing long-term health issues, and improving the quality of their lives and their families’ lives by learning to eat better. Come see me and I can help you do the same. Check out www.food4success.com for more info, or like my page, Food 4 Success, LLC on Facebook. Also if you or someone you know has diabetes, or just wants to learn proper portion sizing for weight loss, Wednesday, May 4 at 6:30pm I will be having the popular class: Carbohydrate Counting Made Easy. Please contact me for more info and to sign up. Until next time! Wish me luck this week with my strong-willed little one, and if you have a toddler too, God Bless you.